(3.5 stars)Alouy Martinez took us to a place where we have never been before. In this story, the characters find themselves up against Demons, Vampires, Witches, Mermaids, Mer-witches, Sorcerers, Nightshades, God, Aphrodite, Eve and of course .... The Shadows.The main characters consist of Ashlenn, Kaden, Melinda, Christopher, Justin and Darcy. These kids grew up together and seemingly, very wealthy. Their relationships with their parents are all close and these parents would do anything they could to protect their children. Darcy was adopted by Melinda's family, as Darcy's parents died while she was very young. Melinda and Darcy became true sister's, since Darcy was adopted so young. Their relationship soon gets put to the test, with all of the events that soon lead them to their bond. Ashlenn Vandenhoff was known for her dreams. She would have very vivid and detailed dreams, which were sometimes scary and hit way too close to home. What she thought were dreams, were actually visions that soon became very real.Once the children were of age, they were to visit Paris for what they assumed would be a nice and relaxing vacation. They were growing up and their parents wanted them to experience what life has to offer, and find out who they truly are. The friends all loaded up in their respected vehicles to go on a journey that they would never forget. Once they landed in Paris, strange things started happening and their teacher/chaperon would soon be murdered. What in the world do they do now? They are in a strange place, where they knew no one.The friend's became closer than they would have ever imagined. They now have a bond that can never be broken and they depend on each other for their survival. The meaning of friendship gets put to the test and they find that it is not only friendship they desire, but also love. There are a couple of love stories that emerge from "The Shadows", as can be expected. Young, gorgeous and with having only each other, it was bound to happen. However, this book is by no means predictable. Just when you think that you know what is going to happen next, takes a different direction. What seems to be going up is actually going down. What seems to be going right, is actually left. 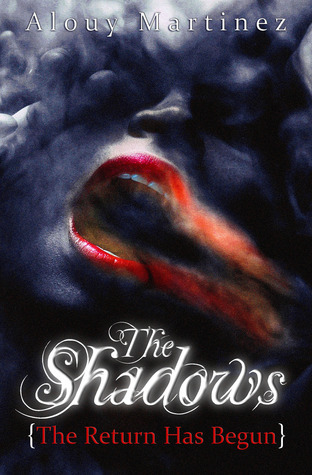 This book does not disappoint, it is suspenseful and captivating.The Shadows has so many details and twists and turns. I found myself having to go back and re-reading chapters to make sure that I was on the right track. That in itself was somewhat time consuming. The other thing I found in the book were spelling and grammatical errors. This by no means takes away from the book, although I was disappointed to find the amount that I did. I still give Mr. Martinez a thumbs up for a very captivating and thrilling read!! Alouy Martinez - Alouy Martinez is a student of Sul Ross State University, who is currently working on majoring in creative writing. Previously, Martinez has won several art contests, and was part of the National Honor Society in high school. The Shadows: The Return Has Begun is his debut novel, and first major project, both in the media of writing and art. When not in college, the author lives in Presidio, Texas and was born in Hobbs, New Mexico.